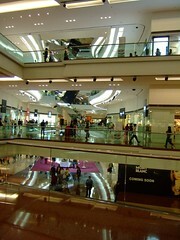 The Gruen transfer refers to the moment when a consumer enters a shopping mall, and, surrounded by an intentionally confusing layout, loses track of their original intentions. Spatial awareness of their surroundings play a key role, as does the surrounding sound and music. The effect of the transfer is marked by a slower walking pace and glazed eyes.